While The J celebrated Israel’s birthday at the August 19 Israel Experience festival, a mosaic in honor of the milestone birthday was unveiled. The six-by-four-foot mural, not including the edge, which contains about 25 square feet of glass tile, will soon hang in the lobby of The J, where its artist, Dr. Lisa Klein, spent several weeks creating the work of art and answering questions from curious passers-by. In fact, Klein drew her inspiration for the mural from the logo for the 70th anniversary celebration. A pediatric cardiologist, Klein has been on sabbatical from her profession to discover her muse. She has only been making mosaics since spring 2017, but her natural talent and love for the genre shine through her work. Lenae Price, philanthropy and outreach director, noticed Klein’s mosaics and encouraged her to make more, Klein said. When the opportunity came to make a mosaic celebrating Israel’s birthday, Price approached her. She was profiled on WHAS 11 on August 1 as she worked on the project. 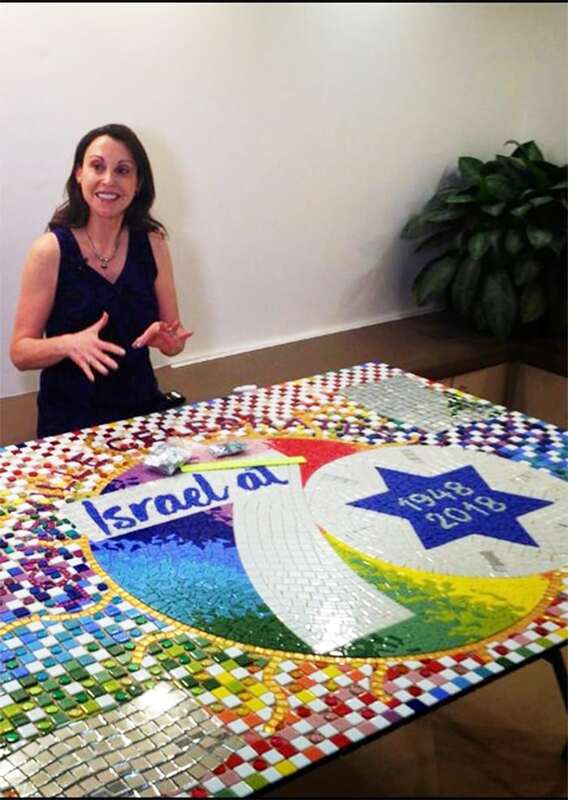 Fittingly, Klein attributes her origins as a mosaic artist to a trip to Israel. She and her husband, Robert M. Klein, co-chairs of the Jewish Federation’s Partnership2Gether in Louisville, visited Israel in January 2017. There, they met up with a photographer friend, Jochanan Kishon, and hiked in Tzippori National Park, where they saw ancient mosaics. That’s just what Lisa Klein did. Throughout most of her life, her artistic side has been in music. She has played piano since childhood, and she’s been playing harp for the past 13 years. She has had some vocal training, too. Her next big artistic endeavor, she hopes, is to land a part in a CenterStage play.